Ayrmer Software Intuitive software solutions is a brand of Ayrmer Software Ltd., and represents our primary goal, building intuitive software solutions for businesses. 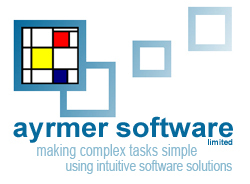 Ayrmer Software was founded in October, 2002 by Charlie Collins. Initially the business traded as a sole trader, moving into its current offices in April, 2005. It has continued to thrive and employs four staff and two sub-contractors (for non core activities). After six years of trading the business incorporated in August, 2008. The new business name is Ayrmer Software Limited, although little else has changed having established itself as a leading provider of bespoke software solutions within the South West of England. Our logo is based upon the abstract art of Piet Mondrian. The purist approach to a visual and emotional statement was the objective that the artist was trying to achieve in his de-constructive work; removing all unnecessary and distracting elements from the core message. We believe that our approach to software development should be based on the same foundations of pure function and end usability, which is why our tag line is making complex tasks simple.